You can visit your local mall, find a fancy card shop and spend time helping your child pick out just the right card for dad. But – do you know what the rigth card is? Without a doubt, it will be the one your child makes – and it is easy, and you can help! Try any of these instructions I have found for you, get creative and make that special dad happy this Father’s day! This card will be lots of fun for your child, you and more importantly – for dad! And the best thing is that you can help your child make this fun card with ingredients you most probably already have in your kitchen. Dip the paintbrush or cotton swab into the mixture and use it as “invisible ink” to draw a picture or write a message for dad on the white cardstock. Allow it to dry for 5-10 minutes. If you are using baking soda, brush off any dry pieces. You should be able to see faint image of the picture or message only. Now you use marker to write a special message on the inside. You can just write Happy Father’s Day or create a special message – this depends on the age of your child and his or her capabilities. 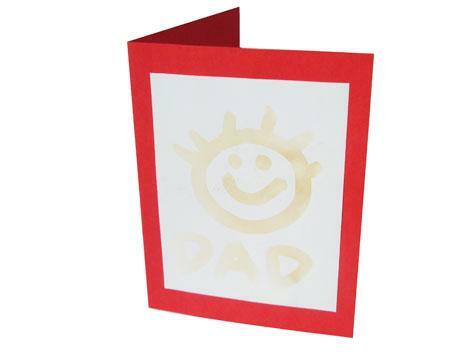 Give the card to dad on Father’s Day and wait for him to try to figure out why the front of the card is blank. Then have your child (or yourself) tell him the front is done in invisible ink and that he needs to use an iron to see what it says. The iron needs to be set on “cotton”or highest setting and steam setting must be off or the card will get wet. It will take a minute or two for the secret message to appear gradually. It can be a little tricky to write a message you can’t really see. It is a good idea to practice on a scrap piece of paper first. You can also have your child or yourself decorate the edges of the card with crayons, markers or little stickers – make it personal and it will be treasured for years to come! 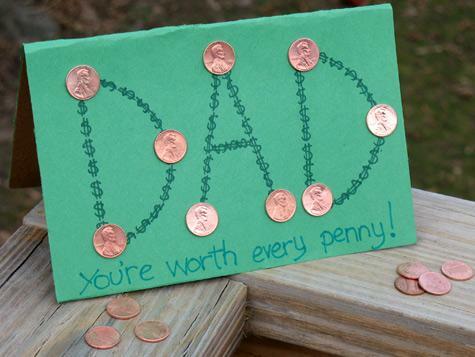 This is a perfect card for dad – and a lots of fun to make with your child! Fold the green construction paper and cardboard in half like a greeting card. Place the cardboard on the inside of the green construction paper, lining up the fold lines and use a glue stick to attach the cardboard to the construction paper. Trim off the excess paper if needed. 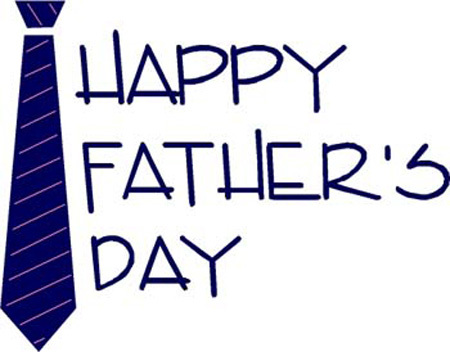 Use pencil to lightly write “DAD” across the front of the card, leaving about 1.5″ space underneath. Use white craft glue to attach a penny to each corner of the D’s, where the curve meets straight lines, and at the center of the curve. Glue a penny to the top of the letter A, and two at the bottom. Write, “You’re worth every penny!” underneath “DAD” with blue fine point marker. The pennies add quite a bit of weight to this card, so even card stock or poster board is not sturdy enough, be sure to use the cardboard or your card will not stand freely. This card will be very much appreciated by those daddies who loves to fish – especially when his little offspring has created it! Fold the blue construction paper in half like a greeting card, set aside. Draw out the shape of letter D and cut out the letter. Repeat for the other piece of patterned paper. Cut out one of triangle shapes from the pattern from the yellow construction paper. Repeat with the green construction paper. Use a glue stick to attach the tail and fins to the fish by gluing to the back of the D shaped patterned paper. Check out the picture of this card to see it more clearly. Cut the pointed ends off of the toothpick. Tie the string to one end of the toothpick and trim one end. 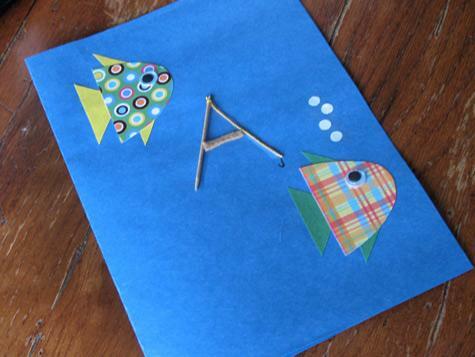 This is your fishing pole letter “A. First place your fish and your fishing pole (D A D) onto the front of the card. Once you have them where you want them, use the glue stick to attach the “D’s” and the white craft glue to attach the “A”. Glue on wiggle eyes and use a sharp pencil to draw a hook at the end of the fishing line. Let dry completely. While patterned paper is cute, you can also have children make their own by coloring white paper with markers or crayons and cutting out your D’s. Use card stock instead of construction paper for a sturdier card. Hope this information was helpful to you and that you will venture into the creative world! I will very much appreciate if you send in your pictures of what you and your child have created for that special dad! This was loaded with a lot of great information. Hey I was searching for valuable feedback on supplies for large format printers. Your blog was listed on Yahoo in this category, you have an informative site. Thanks for the feedback and I do hope you visit my site regularly even though I don’t know much about supplies for large format printers! 🙂 Thanks again!